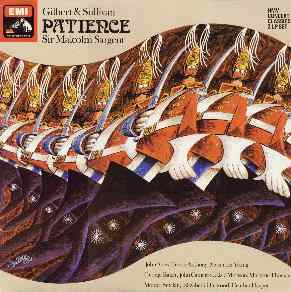 This recording was the penultimate entry in Sir Malcolm Sargent's series of G&S recordings with grand opera singers. It is one of the least satisfying, mostly because septuagenarian George Baker was simply too old to play the aesthetic poet Bunthorne. D'Oyly Carte's 1961 recording with complete dialogue is preferable in nearly all respects. I went out and bought Patience on CD on a whim, and the local record store had only the Glyndebourne one. I gritted my teeth and bought it. Mistake. I have the Glyndebourne Iolanthe, and it's not bad (and it has wonderfully funny cover art), but the Patience is soporific, and no one is well cast, except for maybe Jane and Angela. 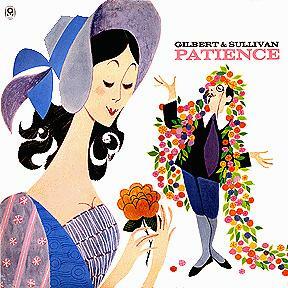 I think Patience is a show you have to be careful with, or it can slide into "dull," and this recording is dull squared. That snappy cello opening of "Let the merry cymbals" is played slower than I ever want to hear it played again, thankyouverymuch. Luckily, I have the 60's DC recording on LP. This recording was originally issued on LP. 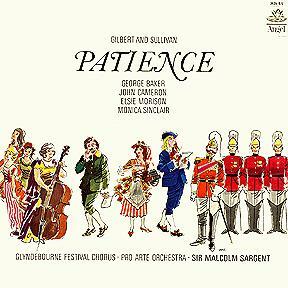 As Patience is such a short opera, EMI was able to re-issue it on CD coupled with Sir Charles Groves's 1968 recording of Sullivan's Symphony in E ("Irish") with the Royal Liverpool Philharmonic Orchestra. Jul. 1989 EMI Stereo LP EX7 49597-1 Also includes Iolanthe. CD CDS7 47783-8 Also includes Sullivan Symphony in E ("Irish"). 1999 HMV CD HMVD 5 73678 2 Slimline double sold in HMV shops exclusively. Also includes Sullivan Symphony in E ("Irish").